In a move that could alter the economics of the global solar industry, California utility PG&E on Thursday announced that it will buy 800 megawatts of electricity produced from two massive photovoltaic power plants to be built in San Luis Obsipo County on the state’s central coast. The 550-megawatt thin-film plant from Bay Area startup OptiSolar and a 250-megawatt PV plant from Silicon Valley’s SunPower dwarf by orders of magnitude the five-to-15 megawatt photovoltaic power stations currently in operation around the world. Most of the industrial-scale solar plants designed to replace fossil-fuel power use solar thermal technology, meaning they deploy mirrors to heat liquids to produce steam that drives electricity-generating turbines. Photovoltaic power plants essentially take the solar panels found on suburban rooftops and put them on the ground in gigantic arrays. How gigantic? OptiSolar’s Topaz Solar Farm will cover 9 1/2 square miles of ranch land with thin-film panels like the ones in the photo above. Combined, the two solar plants would produce enough electricity to power 239,000 California households, according to PG&E (PCG). First Solar (FSLR), a leading thin-film maker, has an annual manufacturing capacity of around 275 megawatts – which will rise to a gigawatt by the end of 2009. (First Solar is building two small-scale solar power plants for Southern California Edison (EIX) and Sempra (SRE).) SunPower (SPWR) is expected to produce 250 megawatts worth of solar modules this year; its California Valley Solar Ranch project for PG&E alone will be consume 250 megawatts. “If we were trying to do it this year, it would be all of our production,” says Julie Blunden, SunPower’s vice president for public policy. “SunPower is ramping very quickly. By 2010 our production will be at least 650 megawatts.” SunPower’s solar power plant is set to begin producing electricity in 2010. 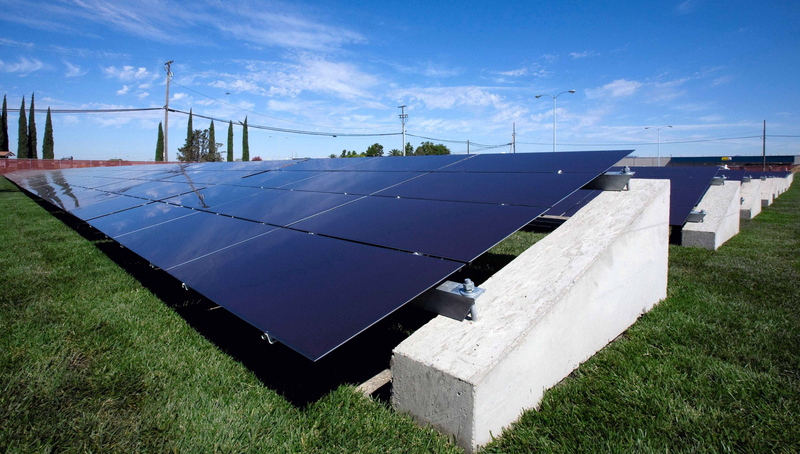 The PG&E deal puts OptiSolar in the spotlight. Founded by veterans of the Canadian oil sands industry, the stealth Hayward, Calif., startup has kept its operations under cover, avoiding the media as it quietly set up a manufacturing plant in the East Bay and prepared to break ground on a million-square-foot factory in Sacramento. OptiSolar CEO Randy Goldstein told Green Wombat that the company will have no problem producing enough solar cells to build Topaz, which is scheduled to go online in 2011, as well as fulfill contracts for some 20 small-scale power plants in Canada. “Our plan has always been to produce solar energy on a very large scale to make it cost-competitive, even in a market like California,” Goldstein says. The terms of utility power purchase agreements like the ones OptiSolar and SunPower have signed with PG&E are closely held secrets, but it has long been an open secret that building massive photovoltaic power plants was not economically viable. Last year when I attended the opening of an 11-megawatt PV power station in Portugal – which offers generous solar subsidies – that was built by SunPower’s PowerLight subsidiary, PowerLight’s CEO told me that pursuing such projects in the U.S. was not an attractive proposition due to market incentives and public policy. So what has changed too make constructing gargantuan PV power plants profitable? Photovoltaic power plants do have certain advantages over their solar thermal cousins. They don’t need to be built in the desert, thus avoiding the land rush now underway in the Mojave. PV is a solid-state technology and with no moving parts – other than the sun tracking devices used in some plants – they make little noise and are relatively unobtrusive. Most importantly in drought-stricken California, they consume minimal water. And the modular nature of solar panels means that a power plant can start producing electricity in stages rather after the entire facility has been constructed. With the PV plants, PG&E now has contracts to obtain 24 percent of its electricity from renewable sources. But contracts are no guarantee the even a watt will be generated. The Topaz and California Valley projects must overcome a number of obstacles, not the least of which is the U.S. Congress’ failure so far to extend a crucial 30 percent investment tax credit for solar projects that expires at the end of the year. SunPower’s Blunden acknowledges the PG&E project is contingent on the tax credit being renewed. Then there’s the question of how welcoming rural San Luis Obispo County residents will be to two massive solar power plants in the neighborhood. Along with a 177-megawatt solar thermal power plant being built by Silicon Valley startup Ausra for PG&E adjacent to the Topaz project, the county has become a solar hot spot. Ausra has run into some community opposition and state officials are growing concerned about the impact of the power plants on protected wildlife. Well if hagar the horrible said its a good ideal then it must be! I don’t get why PV technology can’t be applied to rooftops everywhere, rather than taking up acres of land. In fact, solar energy may already be at the point where the idea of a grid is obviated. How hard or expensive is it to become self-sufficient for electricity? With transmission losses and all the other issues associated with distribution of electricity, should we not be thinking laterally about minimising infrastructure? Can the economic model cope with consumers that are also producers? I don’t get why PV technology can’t be applied to rooftops everywhere, rather than taking up acres of land.YES YOU CAN..BUT BE READY TO SPEND FOR THE INSTALLATION. IF THE FED GOVT CAN BE MORE LENIENT IN GIVING SUPPORT TO PEOPLE WHO WOULD LIKE TO MAKE A DIFFERENCE TO THE SOCIETY AND THE ENVIRONMENT, OUR ROOFS WILL DOUBLE AS SOLAR FARMS. AND I WILL GLADLY USE MINE TO HELP.In fact, solar energy may already be at the point where the idea of a grid is obviated. LIKEIN GERMANY? YES, IT WILL TAKE A HUGE AMOUNT OF “GREEN” HORMONES TO BE COMMITTED TO SUCH ENDEAVOUR.How hard or expensive is it to become self-sufficient for electricity? NOW, YES, IT’S A BIT EXPENSIVE. BY 2010…IT WILL BE MAINSTREAM AND FAIRLY CHEAP. GIVE ABOUT 3-4 COMPETING COMPANIES WHO WOULD LIKE TO GAIN A FOOTHOLD IN THE SOLAR INDUSTRY AND IT WILL BE A BUYER’S MARKET BY THAT TIME.With transmission losses and all the other issues associated with distribution of electricity, should we not be thinking laterally about minimising infrastructure? ECONOMIES OF SCALE, YOU NEED INFRASTRUCTURE TO REALLY TAKE ADVANTAGE OF SOLAR POWER. 100 ROOFTOPS CAN BE MORE EXPENSIVE TO CONNECT TO THE GRID.Can the economic model cope with consumers that are also producers?IN DUE TIME, IN DUE TIME. WE WILL GET TO THE LEVEL OF GERMANY BY THAT TIME. STUFFS LIKE THESE NEED TIME TO GAIN MOMENTUM..IN THE MEAN TIME, START BY PUSHING (SHOVING) YOUR OFFICIALS TO DO THEIR PART REGARDING THIS ENDEAVOUR. San Lois Obispo is on the coast, just North of Santa Barbara. Bakersfield is about 100 miles inland, and I consider it to be a pretty place to move to. I would really like to see the full-cost return on investment calculation for this project. My gut tells me it is another feel-good thing to do that is a huge loser from an economic standpoint. Is the price of the 9.5 square miles of California real estate included in their cost calculation? Probably not. A better plan would be to put a coal-fired plant on one-half square mile and turn the rest into a nature preserve. Then take the rest of the savings and start buying up all the Brazilian rain forests. If an energy project isn’t economical without 30% government (i.e. taxpayer) subsidies, it shouldn’t be considered a benefit to society with government subsidy. So now the environmental groups are anti-solar? Add it to the list of can’t do’s: hydro, coal, oil, nuclear, wind (kills birds! ), etc. Hagar’s right, this area is very lightly populated and lightly farmed. As for doing PV only on rooftops, that needs to be part of the solution but only part. In Germany, about 80% of the installed capacity is rooftop; I suspect less than that will happen here just because our solar resources are so concentrated in the Southwest. It just makes more economic sense to do larger projects in less-populated areas alongside rooftop projects in populated areas. There is no money for the greedy pigs behind all of this if you were to put them on rooftops. I wonder who will have first dibs on Optisolar’s stock offering? Dave, I know where SLO is, I live here. I also know that the PV plant is (if) going to be built on the eastern county line of SLO COUNTY in California Valley not the city on the coast, its just out side of soda lake (a white mud calcified low drainage point, not even a lake, smells bad too!!) for reasons of agricultural zone laws that are on the books that allow for industrial land use. A solar plant was attempted out there a few years back as well (failed). I hope you meant SLO was a nice place as I agree completely just very expensive, Bakersfield on the other hand leaves much to be desired. My point is no one will want to live near the plant as it is far below even Bakersfield Wasco Taft standards so they will have to commute hence my point of Hwy 58 from either the east Taft/Bakersfield or the from the west Paso/Atascadero/SLO. I already work as a power plant operator (almost 20 years)and would not take the job there (even twice the pay) as I would never raise a family in California Valley I have been there and seen it. As well in my opinion it is not commutable as it is a 90 min drive of continuous 20mph blind turns and hills from either direction. It is a very beautiful drive when green if out for the scenery, just not something that can be done every day, kind of gets away from the point being green energy promoted. Now if they were to build such a plant actually near SLO I would be among the first of many competing for operational positions. What we are actually waiting for is the desalination plant that is going to be built actually in the SLO area. Please don’t take this as a personal attack, not my intentions. I just don’t see it as being long term viable from an operational perspective, manning and maintenance. I took humor at the “Then there’s the question of how welcoming rural San Luis Obispo County residents will be to two massive solar power plants in the neighborhood.” Its in BFE, if it goes in it can only help the area. Its NIMBY enough to pass for actual SLO residents. End result: a mirror suitable for Malibu. There are companies that are helping people go green with PV, Pursol solar has a Solarized program to name one. we need to look at the economic impact that are generated by increased employment opportunities. Get ME energy, but not in my backyard. My next home will be an on grid, annual net zero energy producer. We will generate enough power with our 12 KILOWATT array to provide water, light, heating and cooling for a 2500 square foot home Right here in (not so) sunny Oregon. With the energy incentives available right now the system will produce power at 9.5 cents/KWH when I ammortize the install cost over 25 years of energy production. The CURRENT rate here is about 10.5 cents/KWH. I get a kick out of all of the know it all types who really understand very little about what it takes to become your own energy system. If you can’t do anything yourself (not technically/mechanically inclined) you will pay around $10 per installed watt. In Oregon, depending on the size of your system, your actual cost could end up being $3-5 after the energy incentives. The only thing that slows this revolution is people’s lack of understanding and the bureacracies of the permitting process. This is utter hogwash. “The environmentalists” (as if they are one homogeneous group) are the ones who are PUSHING for alternative energy. 99% of environmentalist are NOT against solar. And probably 90% are not against wind energy (the 10% who are are misinformed flakes). I should have figured that now that the environmentalists are becoming successful in implementing alternative energy for this country that Fortune magazine would have to get in a verbal “jab” for the right-wing to save face (i.e. “The environmentalists are against alternative energy!). Please! If that principle was applied to the massive subsidies that other industries GET then I might agree. However, that would include the HORRENDOUS AMOUNT (TRILLIONS OF $$) TO THE DEFENSE INDUSTRY! It is going to effect SLO county.I appreciate those who understand that solar panels belong on top of rooftops, where they have been proven to be most efficient. I am a Carrisa Plains resident whose property is currently in the center of the Optisolar and Ausra sights. Carrisa Plains is 45 minutes away from Paso Robles and is not an armpit; it is a small farming community where you can find on any given day people on the side of the road taking pictures of the views, wildlife, and wildflowers. I oppose the “Solar Farms” along with residents who will not sell out for the mighty dollar, even as we have been under constant pressure from Optisolar to sell our families home. We do not want Optisolar or any of the three companies to make Carrisa Plains an industrial site. We are proud of our land and I for one do not plan on leaving. The Solar companies have the answer, roof top PV, where the individual or individual companies can make the high dollars. While I agree with Mike that it probably makes more sense to place PV panels on rooftops, I can see that is really not the problem. It is another case of we love electricity but don’t want to live around where they produce or transmit it. Mike stated that he is opposed to turning his area into an “industrial site” but I would guess he has no problem turning on his light switch and receiving electricity from someone else’s industrial site. The Optisolar site is PV and could be placed on rooftops but I am sure they feel they could be more efficient if everything is all at one site. It would be much easier to maintain one large field than to scatter the many square miles of panels over existing structures. The Ausra site is solar thermal that is more efficient but requires a conventional style generator and must all be at one place. Now I don’t believe Mike should be forced to sell his property but this is something we have to deal with if we are going to build solar, wind or nukes. There is just simply no way we are not going to impact someone’s life. We desperately need to build new transmission lines. People seem to be friendly to wind and solar as long as they don’t have to live by them. I grew up in a very small town in extreme Northern California. They are having the same problem. A company wants to put wind turbines on the mountain but many in the town are fighting it. Funny thing is that most of the people who are opposed to it are relative newcomers from the Bay Area or LA. They don’t want to see the little mountain community change and don’t really rely on the local economy for jobs. Most of the people who were born and raised there think it is a good idea and the jobs would be a nice addition. Like Mike, I too live in the Carrisa Plains and think it is an amazing and beautiful place. We are eight or so miles north west of California Valley and have both ag and natural grass lands full kit fox, burrowing owls, elk, antelope, eagles and spring wildflowers. Any one who thinks this beautiful spot is an armpit obvouisly has no appreciation of nature. We have invested most of our retirement savings in our property on the plains and it now looks like we’ll be over run by these industrial plants. And, while I love the plains, do not want it ruined and totally beleive it is the wrong place for these plants, fighting these giant companies was not in my life plan. We would sell but Optisolar has us over a barrel. They won’t even pay what you have invested in the place and want you to finance them for three years at your expense. The deals they’ve offered are laughable and they should be ashamed of what they are doing to people. I believe the world needs renewable energy real fast but there is no excuse for it to financially ruin people as their property values plument due to the ivasion of these plants ruining our community. So to protect my home, my retirment and my life, Optisolar leaves me no choice but to be steadfast supportor of what I deep down know is really right: Carrisa Plains, with one of the highest concentrations of special status species in california and which is a key migration corridor for federally endangered species and for native game species for which the state of CA has spent considerable effort and millions of taxpayer dollars to re-establish, is not the place for 15 plus square miles of solar power plants. Go make your billions of tax incentive fueled profits somewhere else! Surely the area required won’t be larger than a mall and parking lot will it or a golf course even? Don’t you think that the people wherever you are getting your power from have the same problems and give up some space so you can have electricity and cut the use of petro fuels. It’s time that everyone sacrifices a little and get us off of the foreign oil spigot. Next time a hurricane heads for the gulf and oil goes up think about the sacrifices those people are making to get things going again and how much of their space was taken up so you can have gas for your car. Jerry the amount of land required in the Carrisa Plains from the solar companies is 31 sqaure miles just under 20,000 acres a little bigger than a golf course.All this land for these companies is tax exempt.In response to steve I am not on the grid.I provide my own power at the source.So no I do not rely on any major utilities.We can provide power at the source on rooftops just like southern california edison is doing in Los Angeles and be efficient without losing power in transmission like these industrial plants will and would not have to use thousands of acres of land. I’d love to add solar to my nice south facing roof. I am just not sure if the HOA allows it. That is one major issue, the HOA, for allowing rooftop units. In regards to having a solar field in the middle of nowhere, someone will move near it and complain. Denver built the new airport out in the boonies and then folks moved near it. Guess what happened? They complained of the noise. Geez, why did you buy a house near the airport in the beginning? I think we will see more alternative energy come into play. To Keith in Denver these solar plants might be in the middle of nowhere but if you live on the environmentally sensitive Carrisa Plains, it’s in the middle of your beautiful community. And nobody is moving next to it and complaining. It’s moving next to us and planning to over run us. Jerry in Alaska obviously has no idea neither the size of the projects nor the size of the sacrifice I and my neighbors are asked to make. We either get live in the midst of this beyond belief enormously huge power plant or accept Optisolar’s offers to buy our property for less than half of what it takes to replace it anywhere in CA. I’d like to know if Jerry in Alaska is helping to save the world with any “little” sacrifices like the one he thinks we should make. If our state really wanted to help our environment the California Surplus Solar Power bill would have been passed instead of being stuck in senate appropriations. It creates fairness in the solar market and spurs consumer interest in investing in solar power bringing with it important environmental and economic benefits to the state. Of course as it gives individuals more benefits for generating their own power it takes benefits away from the big power companies. Probably because the solar industry now has more lobbyists than anyone else, this bill is stuck and most likely doomed. Jerry, Keith and most people are getting sucked into the idea that these plants are about doing good for the environment. Wake Up! Energy is probably the biggest of big business! These giant solar plants are really about money and power and venture capitalists are not funding these plants for the good of the world. They are doing it to make money. And politicians are aligning with these new energy barons for the power their money brings. Instead of replacing Oil Barons with Solar Barons we all need to make the little sacrifice of investing in renewable power for our individual homes. In the long run, we’ll save money and save the world by not destroying sensitive environments with thousand and thousands of acres of unnecessary power plants and hundreds of miles of transmission lines. I think solar arrays should be installed on parking structures, malls and businesses. Isn’t that where the power is needed?